Way back in the day when that dear old pulp, Horoscope magazine, was all we had to amuse us, everybody's favorite go-to page was a delicious, quirky collection of oddities called This 'n' That. This 'n' That was a special page, unlike anything on earth, a happy hodgepodge of astrological observations, some pithy, some profound. And it could be counted on always to be reliably picayune. Reading and seeing This'n' That was weirdly satisfying, a bit like sitting in the kitchen with your favourite Auntie Alice, a bottle of sherry, two hammers, and a huge goody bag of fortune cookies. 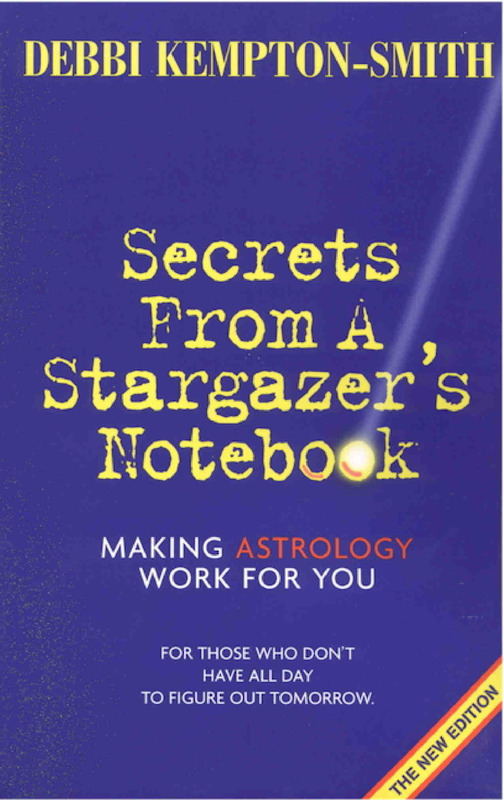 In other words, a great way to learn astrology. If you are ever lucky enough to see an old ish of the old Horoscope magazines -we're talking the Forties, Fifties, or Sixties here, Dearie - you are in for a treat. Times change, editors come and go, and despite my sincerest entreaties - and offers - I could not persuade the powers that Must Make Astrology Serious to revive the beloved page. Don't go on a first date or have a first kiss when the moon is Void of Course. It's unlikely to work out. A young Pisces girl forgot to check the moon and went to the movies with a boy she'd fancied for months. When he went to kiss her, he kissed like a doughnut, pressing his lips to hers in one big ring. No pucker, no suction, no moving lips. Literally a big zero. Fortunately, he is an Aquarian, a sign that doesn't usually get its heart caught in the emotional machinery. They're still friends. Why do so many Republican politicians use astrology, while almost no Democratic politicians do? Geminis have a secret weakness; they cannot resist potato chips. Cardinal signs (Aries, Cancer, Libra, Capricorn) prefer to sit on the aisles, edges, in the front and back rows, or by the exits...where it's easier to make a getaway. Do you dream of working at home in your pajamas? More and more people do. And a lot of them have Uranus, the freelance/independent/rebel planet, in the fourth, sixth, tenth or eleventh houses in their natal horoscopes. The rest work for JetBlue! Libras are born under the sign of the scales; they are great lovers of harmony and balance. A Libran will silently put up with annoyances and frustrations for ages, preferring peace at almost any price. Then one day, the accumulated weight of insults and aggravations become too much for the scales' springs. Bo-i-i-nngg! Planning a party? What sort of party? If you want everyone - and the police they call - up and dancing on the ceiling, party on the full moon. For a more sophisticated soiree, get an astrologer to help choose a bouquet of possible dates. If you're trying to do business with a Capricorn, eat with them. A Capricorn doesn't think you care about the deal unless you do! Entrepreneurs should always check the positions of their progressed Sun and Midheaven and the angles they'll make when contemplating a new venture. It's much easier to launch a boat when the tides are in your favour. Some Aquarians are extremely sensitive to scent. Don't burn incense or wear heavy perfume around them without checking. A bored Gemini can be extremely dangerous. Carry an extra magazine at all times. The bacteria in your yogurt comes under the rulership of Pisces. (Individual containers may vary.) Kangaroos, however, are classified as Sagittarian. If you want something planned perfectly down to the smallest detail, ask a Virgo to do it. If you want a lavish lollapalooza, a rave-up that'll be talked about for years, hire a Leo. How to tell if a Scorpio is falling in love with you... when you're apart, you may sense invisible psychic feelers and tentacles reaching out to find you. Later on, and only if you give your permission, these ESP arms will wrap themselves tenderly around your aura. Where does one find one of these loyal, deep, cuddlesome, unearthly Scorpio creatures? On the Web, of course. The cheerful Sagittarius rising native is also known in the backrooms where astrologers whisper, as 'What Have You Done For Me Lately' rising. Good dancers, though. Bad Santa! If you're a Virgo or have Virgo rising, don't count on Jupiter's transit in Virgo to shower you with riches beyond the dreams of avarice. When Jupiter, the planet of generosity and Father Christmas, passes through the most careful, conscientious, and, okay, the stingiest sign of the zodiac, don't give up your day job. A man will sometimes appear to be more like his Mars sign than his Sun-Sign. Gemini Clint Eastwood, for example, was born with Mars in Aries, the sign of the lonesome cowboy. Donald Trump, another Gemini, has Mars in Leo, the showman. Men with Mars in Libra are famous flirts and lovers of the arts. But some may be wizards in war and strategic planning. Winston Churchill's Mars was in Libra. Born soulmates: people with Venus in Sagittarius and country music. Don't ask for favours, money, or special considerations when the planets are good only in your own horoscope. Look at the horoscope of the person you're asking. Always think of the other guy: that's the secret of success. And what is it with Aries people and their weird predilection for exotic toothpastes - must every tube of goo be striped, black, or imported from South Africa? Does every Aries have to have their very own tube of toothpaste, separate from the rest of the family? 'Fraid so. Do you have a useful tip, funny story, precious gem, or astrological fortune cookie? Send it on! info@topquarkia.com If we print it, you'll get a byline, if you wish, and a Void of Course Moon Sheet.